It’s once again that time of year – awards season is upon us and music’s big night just announced their nominations for the past year. Last year’s awards and nominations weren’t that great, coming off a slightly lackluster year (for this music fan anyways). But this year bounced back with some big albums (Justin Timberlake’s return!) and some big singles. So who was nominated this year? First of all, SARA BAREILLES GOT NOMINATED!!!! You have no idea how excited I got when I heard her name get called. I was literally jumping up and down, and I’m glad no one was around to see me with all my reactions to the nominations. All I kept thinking was “Finally! FINALLY! People recognize how talented she is!” The happiness was a little short-lived after I heard Taylor Swift’s name called, and realized that Justin Timberlake wasn’t nominated for The 20/20 Experience. Really? Best selling album of the year gets no nod? How does that even remotely make sense? Regardless, Sara’s album is the only one I’ve heard in full, so I’m obviously rooting for her, even though she’s the underdog. My bet’s on Macklemore & Ryan Lewis winning though, which is truly great considering they’re technically indie artists, self-releasing their album (re: not through a big label). The only surprise from these nominations is that Justin Timberlake wasn’t nominated for “Mirrors.” I know I’m a JT fan, so I’m a little biased, but come on, “Mirrors” deserved to be nominated. All these songs, admittedly, were some of the biggest songs of the year. Actually, now that I’m looking at the list again, Macklemore & Ryan Lewis weren’t nominated either, which is interesting to me – I would’ve thought “Can’t Hold Us” would be nominated. Considering he was performing, I figured Robin Thicke would be nominated for something, but I have to admit I’m still a little surprised that he was nominated. With all the controversy associated with “Blurred Lines” (the song, the video, the MTV VMA performance…), I foolishly thought it wouldn’t get nominated. I think ideally, I’d want Lorde to win (lies, I’d still want JT to win even though he’s not even nominated), but I’d be okay with any of the other ones (except maybe “Blurred Lines”). On here, it’s the third category. On the Grammy Nominations Live! concert, it was announced first, so as soon as I heard Katy Perry get nominated for “Roar” I was very upset. I kind of figured that with how this stupid world works, “Roar” was going to get nominated and Sara Bareilles’ “Brave” wasn’t (the fact that Sara got nominated for Album of the Year later on made me feel better). Not only did I get upset that “Roar” got nominated, but I also got angry real fast over the JT snub. Again, JT fan, I’m biased, whatever. To repeat, this was the first category to be announced, so seeing how JT was snubbed already, did not bode well for me for the rest of the telecast. Now if I had to choose who would win, I might go with “Same Love” because it has a great message, and this award is technically handed out to the writers of the song, so to have this song be filled with so much meaning might actually give it an edge. That’s not to say the other songs are void of meaning because that’s not true. It’s just that “Same Love” has that strong message that differentiates it from the rest. I definitely expected Macklemore & Ryan Lewis to be nominated, and kind of figured Kacey Musgraves and Kendrick Lamar would get nods as well. James Blake is a name I’ve read but have never listened to any of his songs, so he’s the only question mark for me. Interestingly enough, I wasn’t expecting Ed Sheeran to be nominated because I expected it to happen last year. I know per Grammy rules, if you’re a “new artist” nominated for any award the previous year and you don’t win, you are still eligible for Best New Artist in the current year. With how big “The A-Team” was last year, and with it being nominated for Song of the Year last year, I thought he was going to be nominated in this category LAST YEAR. I was ultimately disappointed when he wasn’t, but now that he is, it just seems weird. So now this year, I’m completely disappointed that Lorde wasn’t nominated in this category, because I legitimately thought she was a lock to be nominated. If she doesn’t win in any of the other categories in which she’s nominated, that means she’s nominated by default in this category next year, right? When it comes down to it, it’s a toss-up between Macklemore & Ryan Lewis and Ed Sheeran. It’s been a long time since a rap act has won Best New Artist, so this might be the year things change. We’ll have to see. I had said prior to the nominations that it would be hilarious if both “Brave” and “Roar” were nominated in this category. And would you look at that? They both are! If it was just those two songs nominated, I would choose “Brave” in a heartbeat but there are other people nominated, one of them being Justin Timberlake for “Mirrors.” Clearly, JT is my pick to win. Most years, the Grammy’s can stretch their definition of pop music, but this year was pretty on point. I personally would’ve put “Stay” under R&B and “Get Lucky” in the Dance category; not a huge deal that they’re in the Pop category though. “Suit & Tie” for the win. With Justin releasing two albums within the eligibility period and how the label packaged the albums, particularly when the second album came out, I figured that the two albums would be submitted as one for consideration. Being that it is 21 songs of awesomeness, of course I’m going with JT for the win. Interesting takeaway: none of these albums are nominated for Album of the Year, but Sara Bareilles’ album, which should’ve been included here, is nominated for the big prize. I normally don’t pay attention to this category, but for one thing, Michael Buble is nominated (yay Canadian! And also, the only album of the bunch I’ve listened to). Secondly, I got caught completely off guard by seeing Cee Lo Green being nominated here. A quick Google search reminded me that this was his Christmas album. There’s also a category called Best R&B Performance, which should not be confusing at all. Like the difference between Record & Song of the Year, the Best Song is awarded to the songwriters, but to make it easier, I list who is singing the song. I didn’t expect Justin to get nominated for “Pusher Love Girl,” let alone in this category, so I am extremely happy about it. But I am also so incredibly happy to see PJ Morton nominated for his wonderfully sweet song “Only One.” PJ, for those who don’t know, is currently playing with Maroon 5 on piano/keys and back-up vocals; he’s such an amazing talent and I love his album. It’s an interesting list of nominees and though I’m excited for Colbie & Gavin’s nomination, let’s be real – Adele is totally taking this. Jay Z’s “Holy Grail” featuring Justin Timberlake is nominated for Best Rap/Sung Collaboration and Best Rap Song. In the Best Rap Song category however, they are nominated against Drake’s “Started From the Bottom” and Macklemore & Ryan Lewis’ “Thrift Shop.” I think Jay Z & JT will take Rap/Sung, but lose to Macklemore in Rap Song. Kelly Clarkson is nominated with Vince Gill for their song “Don’t Rush” in the Best Country Duo/Group Performance. I’m not usually big on country, but it’s Kelly, so I’m obviously rooting for her. I’m not sure how Taylor Swift’s Red qualifies as country, but she’s still nominated for Best Country Album. There’s no way Pharrell loses Producer of the Year (Non-Classical), right? Such a great year for him. Justin Timberlake & Jay Z’s video for “Suit & Tie,” directed by the awesome David Fincher, is nominated for Best Music Video. At the end of the day, Jay Z leads all nominations with 9. Justin Timberlake ended up with 7 nods, the number I thought he would end up with, but I thought he was going to get nominations in the big 3 (which instead means he SHOULD’VE ended up with 10 nominations). Kendrick Lamar, Macklemore & Ryan Lewis, and Pharrell also have 7 nominations. Any surprises? Shocking snubs? The 56th Annual Grammy Awards air January 26th, 2014 on CBS and CityTV in Canada. The Costs of Attending Concerts – Artists Win, Fans Lose? To me, there is nothing like hearing a band or artist live, so it goes without saying that I am an avid concert-goer. In fact, I actually wrote a mini-thesis on the subject of going to concerts for one of my Sociology classes in university. My concert-going experiences run the gamut from the small club shows to big stadium shows. I’ve paid anywhere between $15 to $150 for tickets, including those pesky facility/convenience fees, and if it’s a stadium/arena show, I’ve managed to get some pretty good seats. As my brother so lovingly puts it, I’ve got disposable income, which is why I can afford to go to a lot of concerts. Now, in light of my recent ticket purchase for the Justin Timberlake and Jay-Z Legends of the Summer tour, I felt compelled to revisit the topic of concerts and one of the biggest issues associated with it – ticket prices. You see, the Legends of the Summer tour is kind of a big deal. It’s Justin Timberlake’s first tour in 6 years and he’s coming back touring with one of the biggest names in rap, Hova himself. They’re touring 12 cities, playing at huge stadiums (the Rogers Centre for the Toronto show); it was guaranteed to be big. How big? Well, the ticket prices will tell you – floor seats are running at $300 a piece, level 100 close to the stage are $195 and further back is $115, level 200 runs at $95 each, up another level and you’re looking at $45-65 a ticket. $300 to be on the floor with the possibility of someone taller than you (or way too obnoxious) obstructing your view and thereby hindering your enjoyment of the concert?! Not for me, thank you. This is not to mention the VIP packages available, the most expensive one costing you $1500 for a front row ticket plus some other perks/merchandise, which for the record, doesn’t even include a meet and greet. I’m a big Justin fan but there’s something called sensibility, as well as being reasonable – $1500 is a ridiculous amount of money for a concert. Hell, $300 is already a lot of money for a concert. Due to the current state of the music industry, selling records just doesn’t cut it anymore. Being able to go on tour and putting on a show is an artist’s or band’s biggest moneymaker. It’s an opportunity for the musicians to interact with fans and at the same time, it’s an opportunity for fans to get to see their favourites up close (or at least be in the midst of their favourite acts), enjoy some good music, and have a good time. But what’s the cost of having the best concert experience possible? One of my favourite small club shows that I’ve been to was Matt Nathanson at The Garrison in Toronto back in 2011. I paid $20 for that show and 2 years later, I still have fond memories of it. Matt interacted with the audience of 50 (approx. ), told humourous stories to go along with the songs; it was a lot of fun and the fact that it was a cheap show was pretty much a bonus. That’s not to say I don’t have a good time at arena shows. 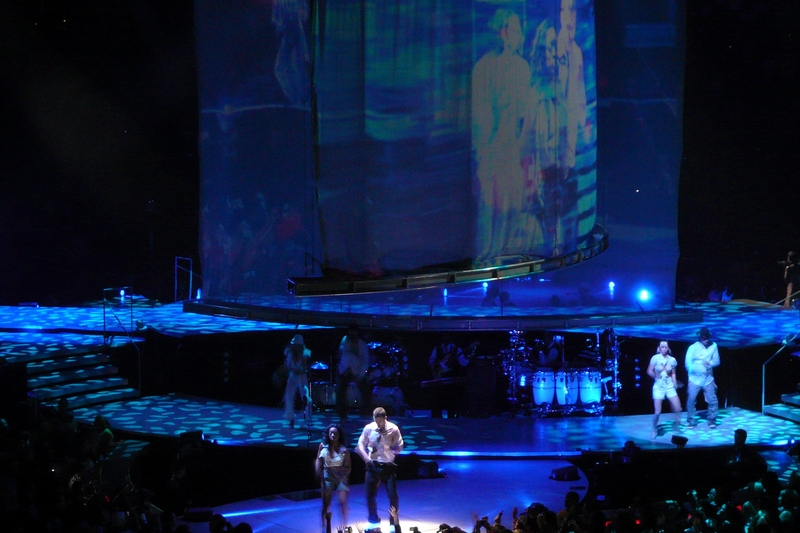 When Justin did the FutureSex/LoveShow tour back in 2007, paying $120 for my ticket already seemed like a good chunk of money, but the show was so incredible that it was completely worth every single penny I spent and then I chalked up the money to see the exact same show on the 2nd leg of the tour. Even to this day, I still compare a lot of other concerts I see to FutureSex/LoveShow because it surpassed my every expectation of what concerts should be like. Even for someone like me who goes to a lot of concerts, I have my limits. I remember not wanting to shell out $150 when Britney Spears came to Toronto on The Circus Tour, because as we all know, live singing isn’t exactly involved and there’s little to no interaction with the audience; you’re pretty much paying for the spectacle of it all. But because it was Britney, I ended up going anyways…sitting in the cheap seats. I have always wanted to see Madonna live because she’s always been such a great performer, but for her past two tours, the ticket prices were always ridiculously high, with the cheap seats not even being that cheap. So what’s a girl to do? Well, simple – not go. Like I’ve said before, going to concerts is a regular and normal thing for me, so ticket prices usually isn’t an issue. At the same time, I also understand that for others, attending a concert, particularly one as big as the Legends of the Summer tour, can be a luxury. I have a friend who currently lives in Edmonton, Alberta and there isn’t a tour stop anywhere around there, so I jokingly tried to convince her to come back to Toronto to go see the show, to which she replied “Tempting, but I should be responsible and not spend a mortgage payment on a concert, no matter how good it will be.” Which to be honest is a fair point to make. Living so close to Toronto and having the money to spend on going to concerts (along with purchasing merchandise and other fees that come up in the process like food and parking) has essentially made me spoiled, but I have friends who can’t be as frivolous as I am and just spend money on any concert that I want to go see. They have to be selective on who they want to see and what their budget is for any particular concert. As exciting and fun as it is to see a band or an artist perform live, the counterpoint can be made that you shouldn’t spend money on something that lasts 2-3 hours, when chances are there will probably a DVD released for it and you can save yourself a lot of money that way, thereby using the money you saved for something more practical. But who’s to say what is practical? If you think about it, the same logic can be applied to going to the movies, buying your coffee every morning, eating out a restaurant – things we spend money on that we don’t necessarily NEED to but WANT to. So for some (like me) the want to go to many concerts (which for the record, stems from the fact that I have varied tastes in music) a year is just the norm. For others, it’s all about saving up to go to that one concert every year that is an absolutely MUST. That ends up being our choice as fans, based on our circumstances and what we want. However, the idea that we have to save up for a concert (not for a car or a vacation) goes back to the fact that ticket prices these days are getting out of hand. The more expensive the ticket, the more of a luxury it seems. And it certainly leaves me wondering what kind of normal person (or sane for that matter) would have the $1500 to spend on a VIP concert package. Yet there are/will be people willing to pay that money for it, which does nothing but benefit the artists/labels/promoters and leave you with probably a fantastic concert experience but a huge hole in your wallet. I understand that the bigger the tour, the bigger the spectacle, the more people are employed as part of the tour roster, thereby somewhat justifying the hefty ticket prices. But in consideration of those fans who might not have such disposable income but would still very much like to experience a concert to its fullest potential, would it be too much to ask for more reasonable ticket prices? Something to think about the next time you want to go to a concert. It’s that time of year again! Award season is upon us, with nominations for some of the biggest names in movies and music are slowly announced. Last night, with the official live nomination concert, we found out the nominees for this year’s Grammy Awards. And as usual, here comes the accompanying rave/rant blog post! I absolutely love how rap & hip-hop is so dominant in this category. All these songs are without a doubt some of the best and most well-received songs of the year. This is gonna be a tough category, but if I had to choose which will win, I think I’m gonna have to give the edge to Eminem & Rihanna. This is Eminem’s year. But I wouldn’t be surprised if Lady Antebellum won because of the number of rap & hip-hop songs nominated alongside them, and voters could be split. I’m surprised that Jay-Z’s “The Blueprint Vol. 3” didn’t get nominated, but there’s no doubt whatsoever that Eminem is winning this. As always, this category is not to be confused with Record of the Year. This category awards the songwriters for any given song, while ROTY awards the artist and producers of a song. If Lady Antebellum does not win for Record, they’ll win here. The song was just so damn good. I remember them performing this song at last year’s Grammys, and that was it, I became a fan after that performance. Drake is taking this, hands down. If for some reason he does not win, I sure as hell hope that Florence and the Machine win. Justin Beiber? Really? And I don’t even know who the other 2 are. I’ve heard the name Mumford and Sons in passing, but that’s about it. I really don’t know who Esperanza Spalding is. You know what would’ve been great? If Matt Morris or Ry Cuming got nominated, although granted, they were longshots. I would’ve even taken Kris Allen or Adam Lambert, but the only Idol to have been nominated in this category was Carrie Underwood, and that was because she was a lock to win (which she did). Because I’m a big fan, I want Sara Bareilles to win. However, her chances are a little on the low side, due to Lady Gaga and Katy Perry. If we base it on previous years, John Mayer practically has it in the bag. But he’s got serious competition this year. Personally, if I had to choose, as much as I love “Just the Way You Are”, I love “Haven’t Met You Yet” more. First of all, GLEE IS NOMINATED?! Not just for a compilation soundtrack (which they are nominated for), but for an actual song. I mean, don’t get me wrong I love Glee, it’s just a little surprising, that’s all. Secondly, why is it the live version of “Hey Soul Sister”? Regardless, Maroon 5 HAS TO WIN! Chalk it up to me being biased, I don’t care, I just want them to win. I have a strong feeling that Herbie Hancock and co. will take this. Never underestimate the veterans, not to mention that’s a lot of people in one song. Otherwise, I would think that Lady Gaga and Beyonce would take it. I can’t believe Beiber is nominated here. SERIOUSLY? You’re telling me that his album is better than Maroon 5’s “Hands All Over,” Sara Bareilles’ “Kaleidoscope Heart” or Florence and the Machine’s “Lungs”? REALLY? I’ll take Susan Boyle’s nom because it sold a ridiculous number of albums, Gaga because it’s Gaga. But Beiber? COME ON! I hate to go against John Mayer in terms of his music, but I’m pretty sure Katy Perry’s gonna win. Another tough one to call, but ultimately will be down to Eminem & Rihanna vs. Jay-Z & Alicia Keys. And that’s all from me. Most of my comments are with the Pop categories anyways. What can I say? I’m a pop music fan first, everything else second. Overall, Eminem received 10 nominations, followed by Bruno Mars (for performing/producing/songwriting) with 7, and Jay-Z, Lady Antebellum & Lady Gaga each with 6 nominations. The Grammy Awards will air on CBS, February 13th, 2011. Best Country Song: Taylor Swift “White Horse” – Good for Taylor. I can get behind her winning here. Best Dance Recording: Lady Gaga “Poker Face” – It’s too bad Britney couldn’t win here for Womanizer, but there was no doubt how big a song Poker Face was. Best Rap Song: Jay-Z, Kanye West & Rihanna “Run This Town” – Well deserved, although Dead and Gone was equally deserving. Best Rock Song & Best Rock Performance by a Duo/Group with Vocals: Kings of Leon “Use Somebody” – Definitely well deserved. Such a fantastic song. Best Pop Vocal Collaboration with Vocals: Jason Mraz & Colbie Caillat “Lucky” – Lucky is such a great song, so I’m really happy that they won. Also, it’s Colbie Caillat’s first Grammy award so it’s just a great win overall. Best Pop Vocal Album: The Black Eyed Peas “The E.N.D.” – Kelly Clarkson should have won for All I Ever Wanted. Truthfully though, The E.N.D. is more of a dance album than pop. Meh I’m just disappointed that Kelly didn’t get nominated for more awards. Lady Gaga opens up the show with an All That Jazz-sampled intro, a medley of Poker Face & Speechless, the latter song being a duet with Elton John. Not a fan of Gaga, but that duet was kinda cool. Song of The Year: Beyonce “Single Ladies” – This award is for songwriting, so I really think Kings of Leon should have won. But it’s alright, Single Ladies was quite the ubiquitous song of 2009; there’s no denying that. Best Country Album: Taylor Swift “Fearless” – Obvious choice. Can’t deny how sweet/humble she is when accepting awards though. Beyonce commanding the full stage for her performance. If I Were A Boy gets a new, and dare I say better, arrangement. I really like the rockier edge given to the song. And a slight cover of You Oughta Know mixed in there? Interesting…I’m kind of suprised though that she left it at that. I was expecting more of a medley, breaking into Single Ladies or something. Pink performs Glitter In The Air. Really incredible and cool performance. Not much else to say about it. Best New Artist: Zac Brown Band – Can’t comment much about them. I don’t really listen to them so can’t say much. Good for them I guess. I was disappointed in the nominations for this award to begin with, but I’m pretty sure it would’ve been either them or Keri Hilson anyways. another commercial break and I kind of want to see some more awards handed out? I mean it is called the Grammy Awards. I don’t want the whole show to be just awards being given out, but would it hurt to have a more balanced ratio? Lady Antebellum performs Need You Now. Again, I’m not really well-versed in the country music scene. I know the names of the artists, but there are very few who I actually listen to. After this performance, I think I might have to give Lady Antebellum a full album listen now. Best Comedy Album: Stephen Colbert “A Colbert Christmas” – Usually an award that gets awarded during the pre-telecast, so it seems kind of out of place during the actual show. Record of the Year: Kings of Leon “Use Somebody” – ahaha “happy drunk” KOL. Awesome win! REALLY well-deserved. Jamie Foxx & T-Pain performs Blame It. There was no doubt that that was T-Pain in the white wig lol. For a song that pretty much entirely auto-tuned, this performance wasn’t half bad. At the very least, it’s better than when it was performed on American Idol last year. That’s not saying much. Justin Bieber has no right in being at the Grammys. He may be a fellow Canadian, but he needs to go away. CBS really is pimping out all their shows huh? Michael Jackson Tribute…in 3D! Celine Dion, Jennifer Hudson, Smokey Robinson, Carrie Underwood and Usher are performing. Followed by MJ’s kids receiving his Lifetime Achievement Award on his behalf. Bon Jovi performing for the first time at the Grammys. Seriously? In their entire music career, they’ve never performed on the Grammys? Wow. They start off with their latest hit We Weren’t Born to Follow and go into Who Says You Can’t Go Home, a duet with Jennifer Nettles of Sugarland. And then for the fan voted song, it’s Livin’ On A Prayer! Classic Bon Jovi. Although I partially wanted It’s My Life for one reason only: the fact that it now reminds me of Glee and that awesome mash-up lol. Best Rap/Sung Collaboration: Jay-Z, Kanye West & Rihanna “Run This Town” – I guess they deserved it, especially Rihanna after the year she’s had. And Kanye couldn’t really lose, he was nominated 3 times in the category. But again, I still think T.I. & Justin should have won for Dead and Gone. It’s just a really good song, regardless of the fact that Justin’s a part of it. Although it would’ve been HILARIOUS if I’m On A Boat won. And last thing, who’s kid was that? Too cute! Mary J. Blige & Andrea Boccelli perform a new version of Bridge Over Troubled Water for Haiti. Amazing. Dave Matthews Band performs, introduced by Adam Sandler. Ricky Martin? But yay Lea Michele!! Best Female Pop Vocal Performance: Beyonce “Halo” – I wonder what would’ve happened if Kelly Clarkson was nominated in this category for Already Gone? Would the votes cancel out due to their slight likeness? Or would Kelly have come out victorious? We will never know. Sidenote, I totally just realized how awesome/funny it is that Lea got to give that award to Beyonce, considering the Halo/Walking on Sunshine mash-up on Glee. hehe. Maxwell performs Pretty Wings. Great song. He is then joined onstage by Roberta Flack. Les Paul tribute featuring Jeff Beck. I would like to know who that girl singing was though. She was kinda awesome. Quentin Tarentino can be the funniest dude sometimes. Drake, Lil Wayne & Eminem performs Forever. Travis Barker on drums. The only thing I don’t like? The fact that there is so much censoring on this song. Total, I think a good 30 seconds to a minute of the song was censored. I can’t enjoy the song when I know the sound gets cut out. Album of the Year: Taylor Swift “Fearless” – Good for her. I absolutely love how Colbie got a mention, and that on the screen where it says the winner, it was written as Taylor Swift & Colbie Caillat. Love. Well, at the end of it all, no surprise, Beyonce and Taylor Swift were the big winners. Beyonce had the most wins with 6. Taylor Swift won 4 including obviously, the big one. Kings of Leon right behind with 3 awards. Overall, it was a slightly uneventful show. We had some great performances, and some not so great. Here’s to hoping that 2010 will be chock full of great music options so we can get a better show in 2011.